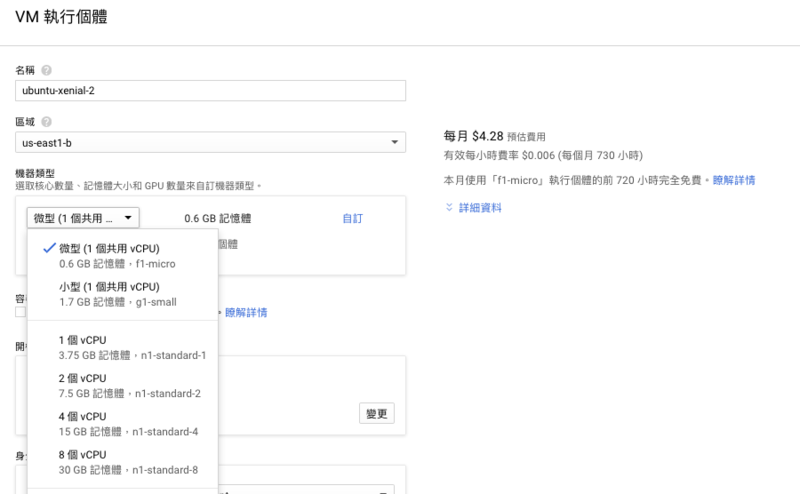 雖然 Linode.com 最便宜的 1GB RAM + 1 CPU Core 只要 $5/mo , 但 Google 更狠, Google Cloud Platform 雲端主機提供一年的免費試用(最高上限可以使用 300美元),試用期結束後,不會自動續約,立刻申請一個來試試看看. 主要的目的是將 http://benjr.tw 的 wordpress 搬到這裡來. 架站需要將防火牆新增允許接受來自網際網路 HTTP 流量及 HTTPS 流量. 或是直接搜尋 wordpress 可以找到已經架設好的如 WordPress Certified by Bitnami 或是 WordPress with NGINX and SSL Certified by Bitnami ,預估費用都是 每月 $14.20 (一樣可自行調整 CPU + Memory 降低花費). 我們架站需要一組固定 IP ,系統預設對外 IP 為臨時的,須到 VPC 網路 / 外部 IP 位址 ,選擇靜態 IP.還要到申請網域的網站修改網址對應 IP 的紀錄. IP 已經設定好要怎麼 SSH 連線到創建的虛擬機,在 Compute Engine / VM 執行個體 點選已經創建好了虛擬機. 透過 SSH 就可以把剛剛在 Linode 備份的 wordpress 與 資料庫 複製到 Google 虛擬機. MySQL 版本需要大於 5.6 或是 MariaDB 10.0 (Ubuntu 16.04 使用)以上的版本. 禁止瀏覽 WordPress 檔案和資料夾清單需要在 .htaccess 加入下面的敘述,詳細關於 .htaccess 設定請參考 – http://benjr.tw/100916 .